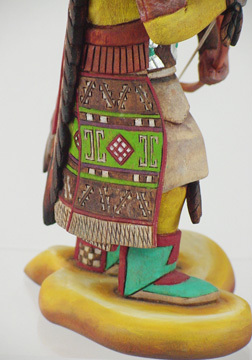 The Ahote is a hunter that originates from the Plains Indians, but has been adopted into the Hopi culture. He comes in two colors; yellow (Sikyahote) or blue (Sakwahote). 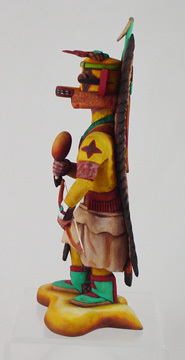 His long and trailing eagle's feather headdress resembles a Plains Indian warrior. The colorful triangular patch with pendant colored circles between the eyes, represent the flowers of spring. 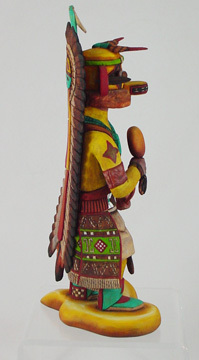 Ahote appears in the Mixed Dance and the Plaza Dance. Sometimes, he carries a roast or boiled corn to give to the audience during his performance. 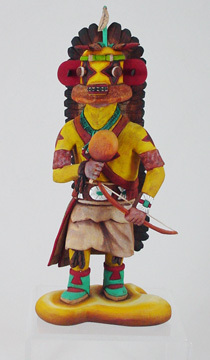 "In a Plaza Dance it is not unusual to see a line of Sakwahote with several Sikyahote, and a white or red form as well. 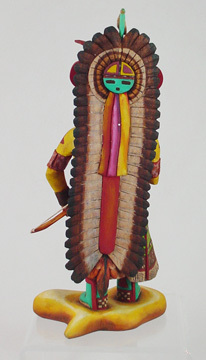 All indications in his costume point to inspiration from a Plains-type warrior, particularly the feather headdress. 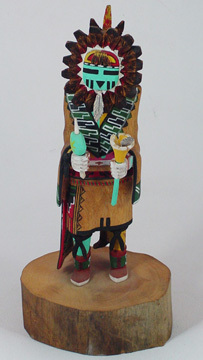 "A'hote may appear in the Mixed Kachina Dances, or the Palolokong Dances and the Plaza Dance. In his left hand he very frequently carries roast or boiled corn that is given out to the audience during his performance." 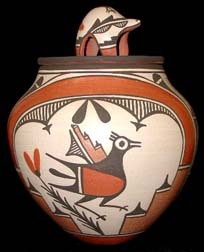 Brian Honyouti was born in 1947 in the village of Hotevilla, Arizona on the Hopi reservation. 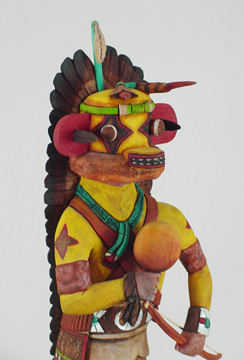 He started carving Kachinas in the mid 1960's, and learned his carving techniques from his father, who taught him how to make one-piece carvings. 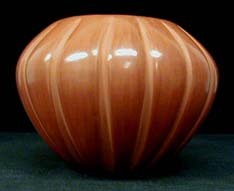 He began using oil paints in 1978, and he is universally credited with being the first carver to use wood preservatives and varnish as a sealer, instead of the usual white undercoat. 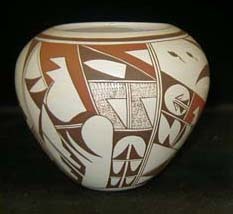 Brian has been distinguished with very many awards at carving competitions throughout the Southwest, including the Hopi Show, Museum of Northern Arizona, and the Prestigious Santa Fe Indian market. 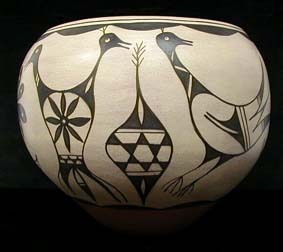 Brian was also the first carver to substitute wood preservatives instead of paint, leaving the flesh areas unpainted and using the natural wood colors. He rarely uses Dremel tools and wood burners, preferring to do all of his carving with pocket knives, chisels, hack-saw blades and small files. 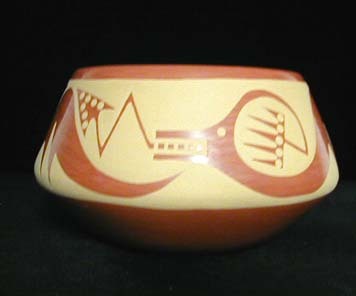 Harold or Harry Nutumya was born in 1956, a member of the Rabbit/Tobacco Clan at Hopi, AZ. 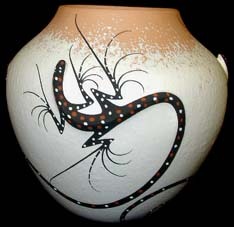 He resides at Oraibi, Third mesa, AZ, and has been carving since about 1972. Ref: Gregory Schaff: Hopi Katsina-1,600 Artist Biographies.